(5x) 1996 FACT Fleer Shell Football Card #71Carl PICKENS. Cincinnati Bengals. 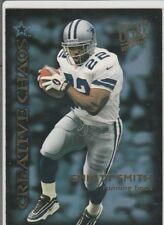 This card is a 1996 Fleer Ultra Creative Chaos.Card #9. This card is a 1996 Playoff Illusions.Card #101. #HT13 ISAAC BRUCE & CARL PICKENS. 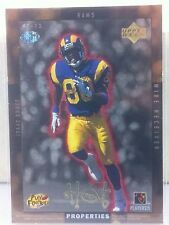 1996 UPPER DECK NFL. HOT PROPERTIES GOLD PARALLEL CARD. This card is a 1996 Pinnacle Team Pinnacle.Card #8. Card Number: HT13. Set: Hot Properties Gold. Product: Upper Deck. Year: 1996. If you're happy were happy! It cost a little more but well worth it in our opinion. SKU: FT B0019 R01 H (2). Add to Favorites. Card#: PF5. Player: Carl Pickens. Set: 1996 Playoff Contenders Pennant Flyers. Team: Cincinnati Bengals. Year: 1996. This card is a 1996 Pacific Bomb Squad.Card #1. Set: Mirror Images Refractor. Year: 1996. If you're happy were happy! It cost a little more but well worth it in our opinion. SKU: FT B0006 R01 K (47). Card Number: 8. 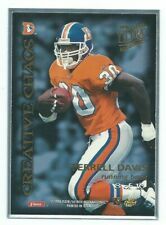 1996 Fleer Ultra Sensations Terrell Davis #8 "CREATIVE CHAOS" Card WL7.